Jake Dykes' own goal left it level for Linfield against Dungannon Swifts. Pic by Pacemaker. Kris Lindsay is optimistic that Dungannon Swifts will soon turn the corner. The County Tyrone side have had a frustrating start to the season, continuing against Linfield where a late goal cost them a point. 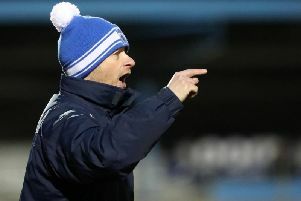 It leaves Lindsay still searching for his first Danske Bank Premiership win as Swifts boss. However, the ex-Blues defender saw enough in this display to leave him optimistic for the weeks ahead. Lindsay said: “We’re not far away - the boys have taken on board what we are trying to do. Dungannon play five league games in November - three of them on successive weeks against sides in the bottom half. Lindsay admits they need to target points from those matches. Linfield, meanwhile, are in good shape a third of the way into the season. This was their ninth win in 13 games, keeping them within a point of leaders Glenavon. They had to come from behind after Douglas Wilson’s first-half goal for the Swifts. Jake Dykes turned the ball into his own net to level it up, before Mark Stafford headed an 88th-minute winner. A disappointing day for Dungannon also included a red card for Seanan Clucas. The midfielder’s first yellow came when he blocked a goal kick, then he was booked for a rash challenge on Andrew Waterworth. Lindsay had no complaints, adding: “The first one was a silly booking, but it was a booking all the same. Lindsay also feels Dungannon need to be more ruthless in front of goal. For Linfield, it was far from their best performance of the season, but boss David Healy was pleased with the result. His side had lost their unbeaten record at Ards a week earlier, so he was glad to bounce back with three points against Dungannon. Healy said: “It was a good win. We certainly weren’t at our best today but when you look at some of the other results in the league, in the end it was a big three points for us. “It is always a test when you come to places like Dungannon, with a new manager. The one negative for Linfield was another injury. Daniel Kearns was forced off early in the second half, joining an already lengthy casualty list.